Turn leftover steak into a new meal with this quick and easy recipe that works well for both lunch and dinner. A simple mix of peppery arugula, juicy cherry tomatoes and crisp red onion is the base for the salad. 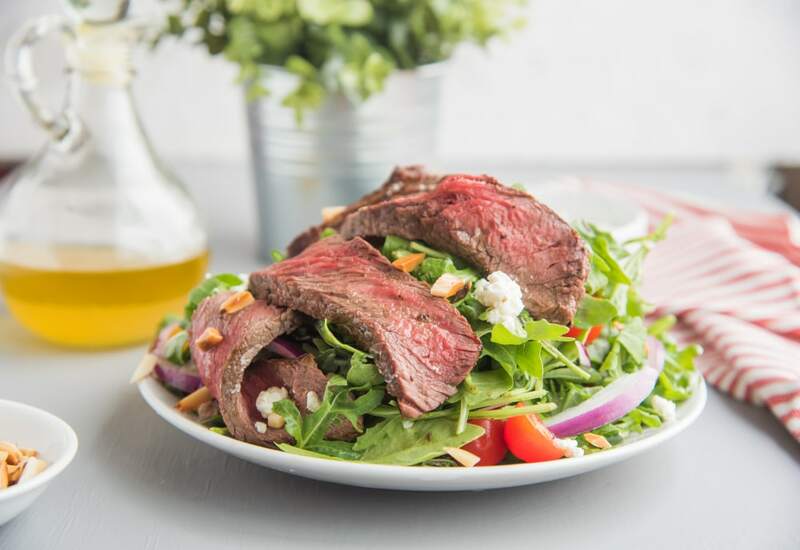 Toss the greens with a tasty honey-lemon vinaigrette, and top with chopped almonds, salty crumbled goat cheese, and sliced sirloin steak for a bistro-inspired salad that's as good as any restaurant. You can serve the steak cold, or let it come to room temperature if you like. Since the steaks is already cooked, the recipe comes together in less than 10 minutes. Make extra dressing by doubling the recipe and refrigerate for several days. Not stuck with leftover steak? For perfect medium-rare, season a 1-lb. steak heavily with salt, then cook over medium-high heat in a cast iron skillet for 4-5 minutes per side, until an instant-read thermometer reads 140° when inserted in the center. Let rest for 10 minutes, then thinly slice. Per Serving: 611 calories; 48g fat; 11.1g carbohydrates; 35g protein; 108mg cholesterol; 407mg sodium. So great to have a steak salad that is not always with blue cheese. I used my leftover garlic and herb goat cheese and omg this is a salad I can get into! I'm not a huge arugula fan, so I used spinach and romaine for the lettuce portion and dressed it with lots of pepper. Still delicious I may add. I dressed the salad and tossed the almonds and cheese in before topping with piping hot slices of steak. Delicious. I love the hot/cold contrast. Really delicious steak salad! The arugula was perfect, I love the spicy flavor paired with the steak. I just added a little more pepper and was good to go. I will definitely make this again, it makes a great lunch. Made this salad without the almonds and used blue cheese instead of goat cheese. I really liked it with the slices of steak cold (from the fridge). It's the perfect way to use left over meat. Made this salad with feta cheese and use regular Italian dressing. My husband, on the other hand, added sliced strawberries to used a sweet dressing.